First of all, let me state quite clearly that I am not a master painter. I have nowhere near the quality output that people see on many websites such as CoolMiniOrNot (CMON). My methods are simple and should produce decent tabletop quality. I do try and improve my techniques and output quality all the time, but I think I can only dream of reaching the standards set on places such as CMON. Most articles found on the internet will advise you, and show you methods on how to paint masterpieces. I read these articles hoping to improve my techniques, but find that many are not much good for painting large armies in a short space of time, or aimed at total newbies to the hobby. My articles shall just focus on my methods, basic as they may be, hopefully helping others to produce figures with simple but effective paint finishes for gaming (probably not for winning Golden Demons!!). The undercoat is a very important first step in painting miniatures, for it can very much determine the final quality of painting and can also affect how your miniature stands up to handling during games. The first tasks for painting miniatures are the questions of undercoat colour, and the choice of paint for this undercoat. In general, I undercoat my miniatures black. Some painters prefer to use white instead, and this is a valid choice since this much lighter colour provides for a brighter final paint job. Black undercoats tend to dull the final finish. I use black simply because it will save time later when doing the lining between different areas of the miniature, for example, when we need to show the separation between a face and a helmet. By using a white undercoat, you will have to wash with a very dark colour later (then requiring touching up of your painted elements) or fine detailing by physically painting the lines in between the miniature areas. For me, I find it much easier to have a black undercoat, and then paint the miniature leaving a fine line of black in the recessed areas and separation points. Black is generally considered to be the lazy colour choice… well; I choose it due to my mountain of unpainted miniatures that scream out to me to get them finished. Am I lazy? Maybe, but it is faster. There are, of course, other choices for undercoat colour choice. You can use dark grey, dark brown, even purple, but for these colours I normally paint these over a white undercoat, as a primary basecoat. 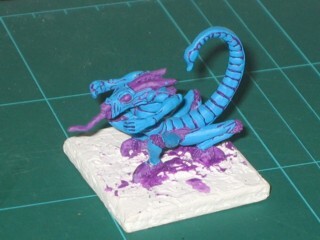 The Fiend of Slaanesh miniature shown here, has a dark purple basecoat painted over a white undercoat, and has then had a light blue second basecoat painted over the required areas of the miniature. Many miniature painters use spray paints to provide the undercoat, mainly due to the fact that it is a fast method. Indeed, I used to spray my miniatures for their undercoat for the same reason, but a number of things caused me to change my preferred method. First of all, sprays are fast. You can cover a lot of miniatures in a short space of time. Brushing on an undercoat takes longer, even using thinned paint and a larger brush, it is slower. However, the need to spray outside may be a problem to some (it’s very hot and humid over here in Malaysia). If you live in an apartment or condominium, it may not be an option. The need to wear a mask to prevent inhalation of nasty fumes and paint spray particles (reminder: it’s very hot and humid over here in Malaysia) can also be a problem for some, in fact for those of us who have beards or ‘goatees’ the wearing of masks is not as effective as it should be since the hair prevents a close fitting of the mask to the face. The spray will probably cover less than 100% of the model, so you will probably have to touch up the undercoat with a brush anyway. There is a certain lack of control with paint coverage and detail obscuring. Many times I have found that the spray paint will fill crevices and impressions, thus reducing the detail that is evident on the miniature when painting. This is much more of a danger when the miniature has a lot of fine details sculpted on it. Hence my preference for brush painting undercoats. It may be slower, but I find that it gives better results and less problems. Right, here’s my opinion on paint brands. Here I shall focus on those readily available in Malaysia, since that’s where I am at the moment. 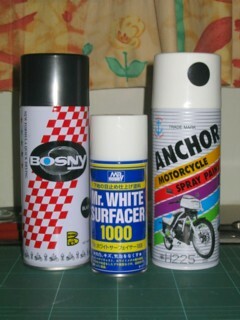 The most common paint sprays in Malaysia, are car paints. The biggest trouble with these is that they are virtually all of a gloss finish and are meant for touching up car panels where chipping or scratching has occurred. They also tend to be quite thick and this can cause more detail obscuring. Not recommended. If you can find car paint sprays that are primers, then of course, these are much better, providing a matt finish that accepts further layers of paints much better. But I have found that these sprays are still too thick to be suitable for miniatures. Not recommended. Art paint sprays. Now these are the way to go. I used to use the undercoat sprays by Games Workshop Ltd. These provided good coverage of the figure giving a nice matt finish and accepted further paint layers very well. Getting hold of Art paint sprays in Malaysia may be a problem since they cannot be sent by air-mail. The ones I have found here have been white. I have yet to find a good black Art spray. If you can find them, and you want to use the spray method, use them. This is my preferred method of applying undercoat. There are a number of paints available, some are cheap, others expensive. Some are more suited for top coats because of the cost. The paints included here are the ones that can be found in Malaysia, without having to take a trip onto the internet for foreign suppliers. Vallejo and Games Workshop. 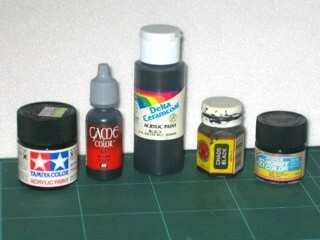 These are among the best paints for miniatures out there, but they are expensive to be used for undercoating. I would leave these for detail and top coat finishes. 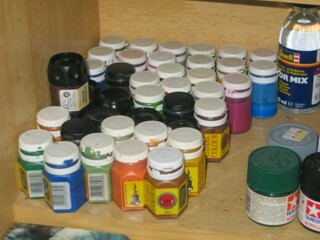 My collection of Games Workshop paints is extensive. I don’t have the complete range, but have been gathering these since they were released, and some of the original bottles are still good to use! My Vallejo collection is small since I have only just started using them (late I know). I use colours from both their Model Colour and Game Colour ranges. They are my preferred brand for detail and top coat painting. Two other brands that I sometimes use are Gunze and Tamiya. 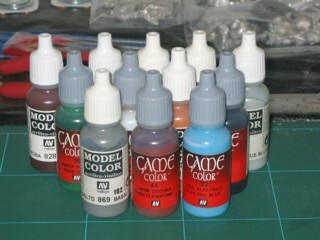 These are not my preferred brands, but sometimes I pick up a bottle or two for colours I need when the equivalent Games Workshop of Vallejo brands are not available here at the time. The Gunze paints are quite good for top coat painting, but I have found that the paint tends to solidify in the bottles very quickly in the high heat and humidity in Malaysia. The Tamiya paints are very thick, too thick for my liking. These paints also tend to be quite glossy, thus giving problems when applying further paint layers. Take a look at the picture on the left. 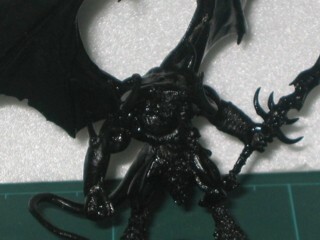 The Winged Fallen One (Heresy Miniatures) has been undercoated using Tamiya, you can easily see from the picture how glossy it is. By comparison, the Deaths Device (Dark Age Games) has been painted with Delta Ceramcoat giving a much flatter matt finish that accepts further paint much, much better. It also has a slighty rough texture that, again, gives a better grip for further layers of paint. Speaking of Delta Ceramcoat, I have found this brand to be my paint of choice for undercoating and base coating. The finish obtained from this brand is extremely good for painting over for basecoats and details. The bottles are large, cheap and have a similar design at the top of the bottle as Vallejo (i.e. you only squeeze out the amount you need), but like Vallejo, the bottles need to be shaken well before using. They can be found easily in Malaysia, much easier than the other brands mentioned here. They are a fairly common sight in hobby and art shops. 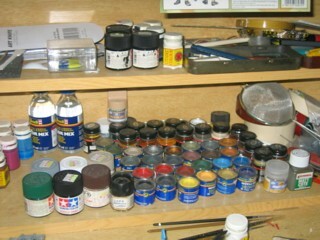 I also have an extensive collection of enamel paints (Humbrol, Revell, Modelmaker) that are oil-based rather than being water-based as the paints mentioned previously. These paints are easy to find, but the need for thinners, and the fact that you can’t lubricate and ‘tidy-up’ the point of the brush with the tongue (as many of us tend to do) tends to limit their use. 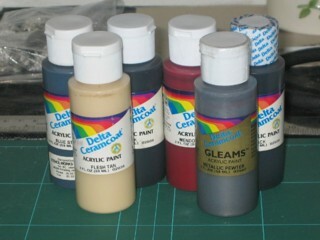 I do still use them, especially for historical models since the accurate choice of colours is there, but I do not use for undercoats. Water-based acrylics are by far much easier and cheaper for this first stage of miniature painting. There are many other brands out there, such as Coat d’Arms and Foundry, but I have no experience using these so I cannot make any comments. 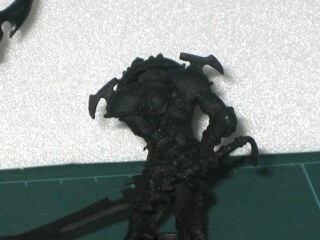 Make sure that you cover the entire model with undercoat. There’s nothing worse when painting the final layers of paint only to find an area of bare metal hidden away, that then proves virtually inaccessible to the brush without getting paint on your nicely finished areas! ALWAYS thin your paints down, yes even for undercoating. Paints taken straight from the bottle will be too thick for application, and will reduce the level of detail on the miniature. Thin them a little, this will allow the miniature detail to still show through, the paint will flow over the surface better, and also, your brush will last longer (un-thinned paint will clog up the bristles given time). So, there you have it. My personal opinions on undercoat paint choice and method. Cheers, I hope this is of use to people! !